Carl August Braun (September 25, 1927 – February 10, 2010) was an American professional basketball player and coach. He played collegiately for the Colgate University Raiders from 1945 to 1947. Born in Brooklyn, New York, Braun was one of the premier guards of the 1950s and spent 13 seasons in the NBA, all but the last with the New York Knicks. 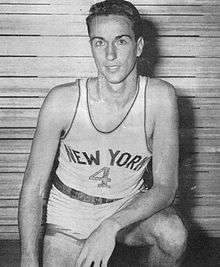 Braun led the Knicks in scoring during his first seven seasons and was named to the All-NBA Second Team in 1948 and 1954. He ended his career in 1962, after one season with the Boston Celtics. Braun played in five NBA All-Star Games and scored 10,625 points in his professional career. Braun was a player-coach for the Knicks in 1960 and 1961 as well, compiling a 40–87 record. Carl Braun is featured in the 1948 Bowman set of basketball cards, the 1957 Topps set, and the 1961 Fleer set. ↑ "Former Knicks star Carl Braun dies at 82 – USATODAY.com". usatoday.com. February 10, 2010. Retrieved 2010-02-10.